Poetry Now, our best-selling poetry anthology for Higher Level, comprehensively covers all prescribed poems and poets for students sitting their Leaving Certificate exams in 2021. Packed with information on the poems and poets, this textbook is written by one of Ireland’s best-known poetry anthologists and literary commentators, Niall MacMonagle. 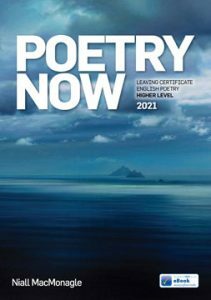 Featuring critical analysis, sequenced layout of poems, line number referencing and a glossary of words and phrases, Poetry Now develops engagement with poetry in an accessible, enjoyable way. Exam-useful glossary, invaluable insights and analyses provided for all poems. Biographical information and overview on all poets, emphasising their lives and contexts as writers. Multiple exam-style questions on poems, including general questions on work by prescribed poets. Detailed critical commentary on all prescribed poems and poets. Full list of previous exam questions asked on prescribed poets. Section on the Unseen Poem with guidelines and sample answer. Hints and advice on how to approach the paper.